Pre-registration open. First Phase: from March 12th to June 28th, 2019. Advertising poster - Informative triptych. 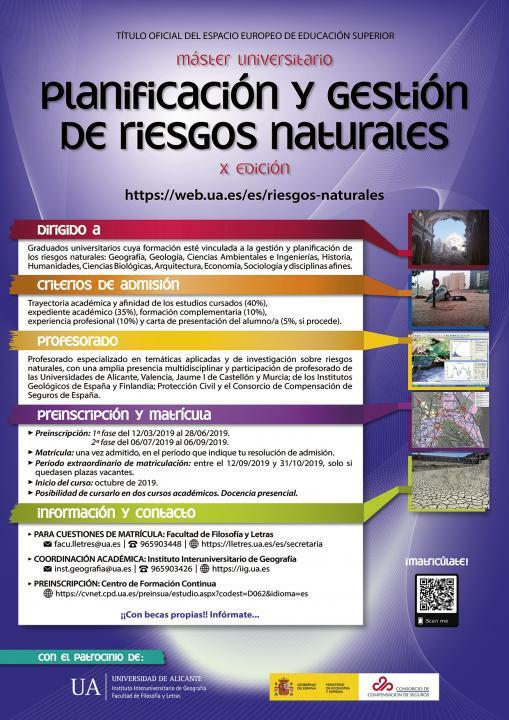 Open the application period of tuition aid to study the master's degree in Planning and Management of Natural Risks of the University of Alicante, academic year 2018-2019. This aid is contemplated in the Agreement signed with the Consorcio de Compensación de Seguros. The next days March 29 and April 5 will celebrate the workshop "Perillositat i risc d'inundació: els estudis d'inundabilitat en la Comunitat Valenciana”, by Jeroni Banyuls i Garcia, from the "Direcció General d'Ordenació del Territori, Urbanisme i Paisatge" (Generalitat Valenciana), and Pedro Millán Romero, from "Planifica Ingenieros y Arquitectos, Coop. V.". Date: 03/29/2019, from 9 a.m. to 2 p.m.
04/05/2019, from 9 a.m. to 2 p.m. Admission is FREE, up to a maximum capacity of 25 seats. A certificate of attendance will be issued for 10 hours. It has published the ninth issue of the digital magazine "Consorseguros" (Autumn 2018). The 2018 call of the Water Joint Programming Initiative (JPI), Closing the water cycle gap, has selected the SIMTWIST project (Simulating tourism water consumption with stakeholders), in which the Water and Territory research group, linked to the Interuniversity Institute of Geography from the University of Alicante (Spain), participates. SIMTWIST is coordinated by the Environmental Systems Analysis research group from the Wageningen University (The Netherlands). The third partner of the consortium is the Department of Civil, Chemical, Environmental, and Materials Engineering, from the University of Bologna (Italy). The researcher Sandra Ricart, from the Water and Territory research group, linked to the Interuniversity Institute of Geography of the University of Alicante, has been recognized with the 2018 World Championship in Earth Sciences (Irrigation). With this distinction, IASR recognizes Dr. Sandra Ricart among World's 500 most influential experts in Applied Science for the year 2018. Congratulations!